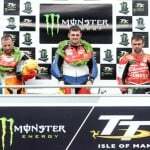 Dave Molyneux won his 17th career TT as he and passenger Patrick Farrance took the second Sidecar race of the 2014 Isle of Man TT. Molyneux is the career leader in Sidecar TT wins and third overall in total Isle of Man TT victories behind Joey Dunlop and John McGuinness. Molyneux and Farrance won the race by a good 44-second margin but they benefited greatly from a mechanical problem plaguing early race leaders John Holden and Andrew Winkle. Holden/Winkle held a commanding 13.6-second lead over Molyneux/Farrance after the first lap. Holden and Winkle stretched their lead early on Lap 2, widening the gap to 16.2 seconds at Glen Helen. They were unable to sustain that advantage however, and by the end of the second lap, the lead had diminished to 11.7 seconds. 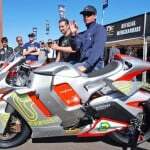 On their third and final time past Glen Helen, it was apparent that something was wrong with the Holden/Winkle LCR sidecar as the lead evaporated to a mere 2.6 seconds. 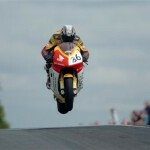 By the next timing point about eight miles later at Ballaugh, Molyneux and Farrance were in the lead with a 17-second gap. Holden and Winkle later dropped to third behind Sidecar TT 1 winners Conrad Harrison and Mike Aylott with Molyneux and Farrance well out in front with an uncatchable lead. 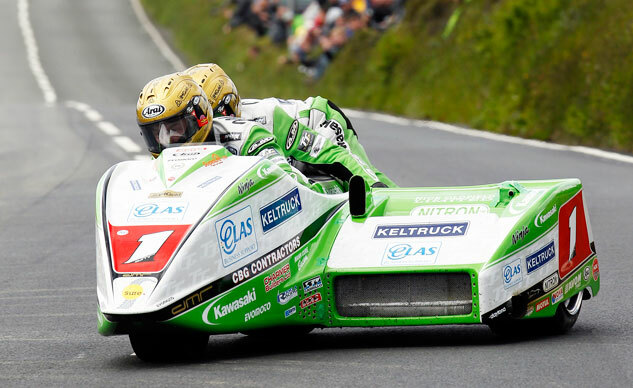 Molyneux and Farrance took the win with Harrison and Aylott taking second for the overall Sidecar class win. Holden and Winkle were able to coax their ailing sidecar across the finish for third, 5.6 seconds ahead of Tim Reeves and Gregory Cluze.